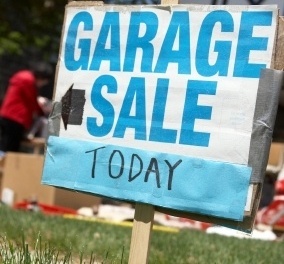 It’s that time of year again — time to clear out all the useless junk in your house, spread it out in your driveway and make LOTS of money with a garage sale! Just because you have no use for that crocheted fly swatter cover and set of Mickey Mouse cheese knives doesn’t mean they don’t hold great value for someone else. Right? But the most confounding part of hosting a yard sale is the garage sale pricing. Price items too high and they won’t sell. Price them too low, and why go to all the trouble? Experts in the yard sale experience tend to agree on basic prices for common items. Stick with the prices most people use, and your toddler’s shoes, paperback books and kitchen gadgets should go home with happy new owners. If you have time, it’s a good idea to scout a few other sales in your area to get an idea of typical prices. And if you have any doubt about whether an item could have real value, check with an appraiser before you slap a $5 tag on it and set it in the driveway. We’ve all heard the stories: The guy in California who purchased Ansel Adams negatives for $45 and discovered later they were worth $220 million. Or the ugly painting that turned out to be by a famous Dutch master. These stories are great for the buyer. Not so much for the hapless seller. It’s good to check. For suggested prices on all kinds of items, from dart boards and baseball gloves to patio furniture and desktop computers, visit the Garage Sales Tracker website. This handy site offers not just pricing suggestions, but garage sale tips for planning and advertising, and suggested supplies you’ll need for the big day. When in doubt, take a good look at your item. How much would YOU pay for it at a garage sale? Admit it: some of your stuff just isn’t worth much. But somebody might want it — if it’s free. 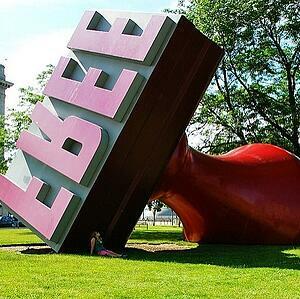 Plus, a big “FREE” sign will draw shoppers to your sale. Some items to consider for your “free” pile: trinket-type toys for kids; refrigerator magnets; odds and ends you got for free, from product samples to rulers and key rings; note pads; magazines; broken items that a handy buyer might want to fix; plastic storage containers. When It’s Over, How About A Dumpster? The last thing you want to do after the hordes have happily walked away with the good stuff is to lug your unsold items back into the house. It’s really sort of depressing. Not only do YOU not want this junk anymore, nobody else wants it, either. Not even for 50 cents. But before you sink too deep into post-yard sale despair, arrange for a Bin There Dump That dumpster to show up in your driveway. Load up your unsold junk and we’ll haul it away. When it’s time for our friendly operators to pick up the bin, you don’t even have to be there. We know you’ll be relaxing somewhere with your feet up. Yard sales are exhausting. We make the clean up easy. When it’s time to load up, contact a franchise operator near you.